Any WordPress blogger out there already knows that most experts recommend to add images to blog posts in order to make them more appealing to readers, to increase credibility and authority, and overall engagement with your content. And you really need this: WordPress is the home for 76.5 billion blogs so far! To stand out in this massively packed space, you need all the visual help you can get. Images to the rescue! There are a lot of aspects to consider when it comes to using images in your blog. And we address them all. Dive in! Stock Photo Agencies – One of the most reliable options. The most serious online stock photo agencies have libraries with millions of images to choose from, commonly in HD or superior quality. Usually these sites sell their stock photos under a form of Royalty Free license, which is very flexible and cover multiple uses in commercial and editorial projects, including blogging. These stock images are paid, but the companies offer very competitive prices for small budgets, ranging from $1 to $15 per download, and even less than $1 each when buying in bulk. Therefore to buy images for website can be very time consuming. The downside is that this system is a bit clumsy when it comes to blogging, that adds many time consuming steps to your workflow: visit a website, run searches, sort results, pick an image, prepay credits, download it to your computer, and finally import it into WP. Free Images Websites – If you don’t have margin in your budget for photos, or if you simply think it’d be good to save that expense, you probably are already thinking about “getting free images for WordPress”. That’s actually a common beginners approach. While it’s true there are certain trust-worthy sources for free images online or from public domain, it is also very true that said “free images for blogs” are a risk when you use them in your website. It’s a much safer practice to go for legally verified, cheap paid images. But if you must use free photo resources, make sure you are doing it right. You can learn more about this in our article about The Risk in Using Free Photos in WordPress. Creative Commons (especially CC Version 3) is know for “free blog photos” but there are many insecurities and issues you need to know about. Find more about these free images issues in our article about the usage of creative commons here. So please be aware of these creative commons images free photos issues, especially if you think that they come with a full creative commons license (cc license). 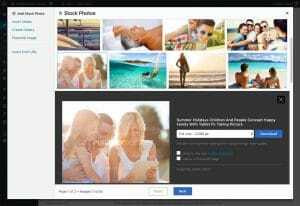 PixelRockstar – There is another alternative to get better pictures if you are a blogger using WordPress. At PixelRockstar we developed a service that aims at providing great pictures to use in blogs and websites on WP, in a streamlined and simple way. Our WordPress plugin integrates a collection of over 4 million high-quality stock photos right into your WP layout, and you can search and apply photos from the library into your posts in a few simple clicks. The service is paid and comes in three different tiers according to the number of downloads. It’s also worth mention all PixelRockstar images are under our custom Digital License specifically designed for publishing purposes, which covers the use of photos in any WordPress site you own, plus in any visual materials to support it (such as social media posts for example). You can also use our images for your social media campaign like on Twitter, Facebook and other platforms. Our license is comparable to a royalty free image license with a limition on the usage on digital platforms. Content related: Make sure you choose relevant images with a concept that relates to your copy and enhances it. Users hate filler images that appear to be there for no reason, and adding images just for the sake of adding them can actually hurt your blog posts. Photos: Choosing photography for your blog images is a smart choice, for most viewers love them. Aim at having a predominance of people photos, which are the ones readers can relate to the most. As for style, go with the most trendy aesthetics of our days: authentic, non-posed photography with real people in real situations. If you use stock images, try to use authentic ones. Keep in mind that stock photography is getting better and better for blogs. Graphics: Infographics are certainly a great addition to your blog posts. Presenting relevant info in a visual and didactic way helps to better communicate your ideas and to keep readers interested. High Quality: This is one not to be overlooked. Studies conclude the quality of the imagery you use in your blog speaks about your level of professionalism. People tend to give a higher credibility status to content that is accompanied by high-quality photos. So aim for the highest resolution you can afford (at PixelRockstar we have affordable HD imagery waiting for you!). Bonus tip! Use proper alt text on your images for a good image seo for Google, Bing and other search engines. Everybody has their own preferences, but if we are going to talk about cold facts based on data analysis, too much of a good thing can certainly be a bad thing. Using too many photos in your blog posts is as bad as using none. So what is the ideal number? It varies depending on the type of articles you write. If you stick to the “short and sweet” concept, then featured image and maybe one image in the body of the post could be sufficient. If you are one for longer, deeper pieces, one image every 350 words is a good ratio. Heads up: the placing of images is also relevant. Experts suggest that using a mid-sized image aligned right or left with your first paragraph is great for reader engagement: it catch their eyes, and the visual illusion of the text lines being shorter due to alignment makes them more keen on reading them. Moreover, images are great to emphasize links and call-to-actions, so using them to introduce an external link or to remark an actionable button or phrase is also a good blogging strategy. Match width to blog content area: set images to be as wide as your blog post field goes, and no further. If you select a bigger width than the field allows, you will simply lose details in the image, or make it look terribly unaligned with your text blocks. Keep an eye on file size: the height and width of your image will also determine how big the file is, of course. And larger files will slow down your load speed. While you should never neglect image resolution, this is another good reason to not to use images wider than your blog content area. Compress images: Compressing technology is a great aid in making your image files smaller, and therefore lighter and faster loading. There’s a wide array of options to use for this. We particularly love Imagify, a service that automatically compresses all images added to your WordPress library. It’s affordable, automatic and very efficient. We love using Imagify here on PixelRockstar as well. Image Optimization: We also recommend that you cut the image you upload to the exact pixel size you need. This will save you time on the upload, speeds up your website and let the compression plugin make their work faster. Use a CDN: The big internet markets are located all around the globe, and CDN services are a very useful way to ensure you reach out to users worldwide with the best loading speed possible. There are very good services for this, like CDN77 which offers website speed acceleration among other solutions for a low cost, and includes a 14 days free trial. We actually use CDN77 here on PixelRockstar and on all our other websites. Armed with our guide for blog images, you will be able to make better and more accurate use of images for blogs or websites. 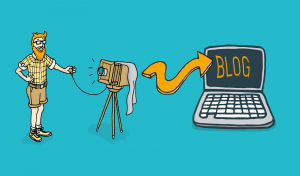 We hope you find our Ultimate Guide to Blog Images in WordPress useful, and that it helps you take your blog images to the next level.